I wouldn’t call myself a big fan of deep-fried food – it’s not that I don’t like it – I just can’t eat much at one time and often find the smell of deep-frying overpowering. I remember that it was a while before I first tried fish & chips here – which is obviously a ‘national food’ in the UK – I just couldn’t get the concept of it at first, ‘why do they eat deep-fried food with deep-fried food?’ Although I now enjoy eating/cooking fish & chips (well, about once a month), our deep-fryer tends to get a bit neglected in our kitchen. However, it’s a different story when it comes to doughnuts :) Matthew actually doesn’t eat many of the desserts I make, but he is at least happy when I make these. I’ve been using a recipe from Japanese Elle a Table (No.27) recently – as I’ve posted before, a Japanese patissier Hironobu Tsujiguchi has been writing ‘East meets West’ type dessert recipes for the magazine and I find them quite interesting. This is basically custard cream filled doughnut but coating them with sesame seeds gives an extra flavour and lends a more interesting texture. The combination of fluffy dough and not-too-sweet custard is definitely good enough, but the sesame flavour imparts an Asian angle to it. I made another filling with azuki bean paste, and lots of cinnamon sugar and raspberry jam for Matthew. Depending on the size of the eggs you’re using you might need to add a little more/less flour, but the dough should be quite sticky. I used groundnut oil for deep-frying but you can use any vegetable oil. To make the dough, place both flours and the yeast in a bowl and lightly mix. Add the rest of the ingredients and knead for about 10-15 minutes until the dough gets smooth and shiny (you can use the kitchenaid of course). Shape into a ball and cover the bowl, rest in a warm draught-free place for about an hour and a half (or until it doubles in size). To make the custard, place the milk and vanilla seeds (as well as the pod) in a pan and bring to the boil, then remove from the heat. Whisk the egg yolks with sugar in a bowl until pale and creamy. Sift both flours into the egg mixture and mix well. Sieve the hot milk into the mixture, whisking constantly, return the mixture to the pan and cook over medium heat, stirring all the time, until the custard thickens. Remove from the heat and blend the butter in, then cool. When the dough is ready, let the air out gently and divide it into small evenly sized balls. Cover them and rest in a warm place for about half an hour. Start heating the oil to about 160-170ºC; coat the dough with sesame seeds and deep fry until golden. When they are cool enough to handle, pipe in the custard cream (or if you prefer jam, perhaps you should omit the sesame seeds). If you would rather have them without filling, coat them with (cinnamon) sugar while still hot. 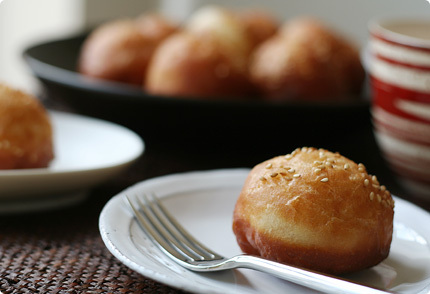 I agree that I might write off deep frying if it weren’t for doughnuts - your heavenly little pillows look delicious! I particularly like the making-of sequence of photos. I love fried foods, but maybe that’s an American thing. Where else can you get deep fried twinkies and candy bars? (Which I’m dieing to try!) Anyway, these look great. I like the use of sesame seeds. I’m sure it lends a great flavor to these beignets. I’ve been enjoying your blog for some months, just wondering, why you only post simple recipe, but don’t share the extraordinary ones. I tried to contact you via email concerning a recipe, but you didn’t answer, so I thought I’d leave a comment. these look awesome...I wish I had a deep fryer.. They look absolutely scrumptious Keiko! Wow, these are beautiful.I have to say that I also despise the smell of fried goods in the house. I loved the fact that we can make these in the oven - will definitely give it a go.My boyfriend also loves doughnuts but the ’frying’ factor really disencourages me. This is great!! 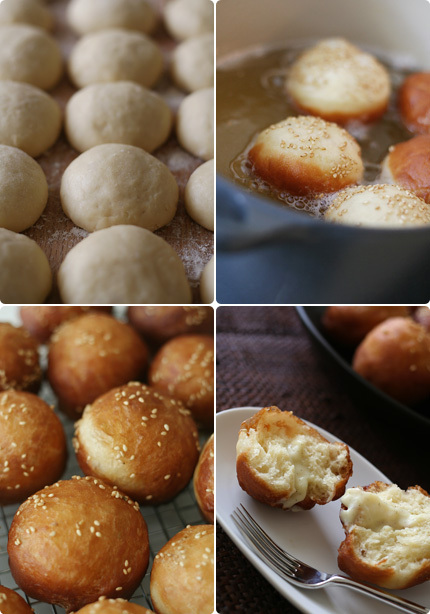 Every year in december, for the jewih festival of Hannukka (when it’s a custom to eat deep-fried food and especially doughnuts) i look for new recipes and variations of the concept: i’ve tried spanish, italian, german, morocco, israeli, french doughnuts..this year, i’ll certanly try your japanese ones.. Thanks again! Oh, my goodness - those centers are creamy! They do look so good. Wish I could have just one with my coffee this morning. Look so good! Can I have one? 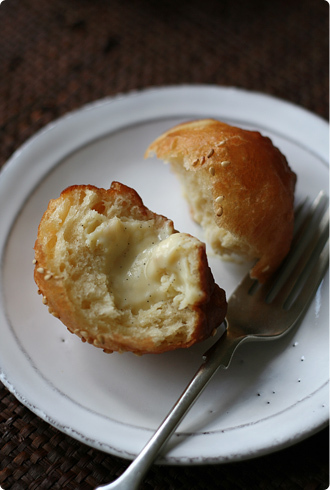 I did not quite understand how did you fill custard in doese little doughs? The doughnuts look great Keiko! I remember the first time I ate a just fried doughnut filled with jam at work. I count it such a priviledge. The sesame seed certainly lends a asian touch to it! It reminds me of a fried sweet dough fritter also coated with sesame seed that is shaped into a butterfly, sans custard. These look gorgeous AND yummy. I really admire your pictures. Mine always look so overexposed compared to yours. I’ve never tried aduki paste before but it sounds really good to me. I love your work so much (i am conscious i’ve used the word SO too many times in that comment but i really don’t know how to express how i feel about your pictures, writing and evident love for good food). Doughnuts! To die for! In Brooklyn’s Polish neighborhood of Greenpoint they make doughnuts with rosehip jelly, fabulous! Dan Lepards recipe on his site for Berliners are so good I did them at work with homemade straberry & Raspberry jams. thank you for sharing the recipe. we adore donuts, especially filled ones! This site has the best photography compared to other blogs in my opinion! And the food look really delicious!!! I’m not a big fan of fried desserts myself but this recipe I could give it a try when entertaining guest in the next celebration. Maybe you could try red bean paste, like the one used for omochi fillings. Keep spreading the joy through your fabulous recipes..
Hi Keiko! Another beautiful photo that sings to my baking soul... they look so heavenly! Thank you for the tips for variations at the end, they sound delightful as well! So golden and so delicious ! I’d prefer cinnamon sugar. Those doughnut are so yummy!With your beautiful pictures,I’m just dreaming eating one...and I’m sure it will be delicious with de custard cream-filling and the sesame seeds! This is no ordinary doughnuts... they’re decadent! Thanks for sharing your recipe - they look too good not to try it. these look great and remind me of the malasadas with cream that we have in Hawaii. If I were making those (which Keiko, I could NEVER come close to your end result) my problem would stem from the fact that I’d finish off the custard with a spoon while the dough was frying up. Oh well, then I’d have to eat all the doughnuts too! As always, thanks for the delicious post. these donuts look magnificent! when you described the ones you filled with azuki beans they remind me of these glutinous rice flour donuts filled with azuki beans that is a common dessert in malaysia. they’re round, puff up when deep fried and is coated with sesame seeds too. Hi Keiko, everytime I come to your blog, Wow is the first word I say :) the centers of the doughnuts look so creamy. I never deep fry - but I could be tempted after seeing these Keiko. I’m with Joey in I love olliebollen too. Gorgeous Keiko, I too would love to bite into one, mmm! These look similar to beignets in New Orleans. Those also get a sprinkling of powdered sugar. we have stopped doing deep fried food at home like you beignets are exception.... am back here in France after months of being here and there.. Anything thats high in calories has to taste good.....and this definately does !!! Would love to sink my teeth into them...any idea though how many calories ??? Absolutely beautiful! And with the custard, I can imagine these being a great hit with my family! Hi Keiko, quelles merveilles ces beignets fourrés à la crème !!! C’est incroyable, tu sais tout faire... Bravo & merci. A très bientôt. I know exactly what you mean about deep fried foods. Most of them just don’t appeal to me. Doughnuts are indeed, one exception, along with fried clam bellies and the occasional really great french fry. I can’t believe Matthew doesn’t eat all your desserts! Wow! I wonder if you could coat them with honey syrup and sesame seeds and make the greek sweet ’Loukamades’ from these? Over here, doughnuts abound (the national doughnut chain has a shop every few blocks), but none look as lovely as that! i’ve been reading your blog and love the article all the time. this recipe reminds me of a chinese delicacy, which is made of glutinuous flour. i do love fried food, so i’m sure i like this recipe too! I like beignet but i don’t make because i don’t like frying’smell. Your pictures are really gorgeous ! That looks delicious! I just had the most wonderfull mini donuts dipped in chocolate fondue at the Mandarin Hotel. I’m going to try out your recipe with my recipe for chocolate fondue. i don like overly sweetened commercial doughnuts found in Dunkin Donut’s! i like them slightly rolled in castor sugar! hmmm.. donutlicious! Deep fried food can be a turn-off especially when the oil is stale or over used. But food deep fried in a good groundnut oil can be oh-so-good! I like how you have made the doughnuts in little manageable bite-size pieces. 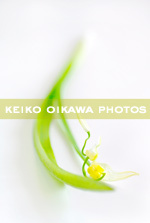 Keiko, your blog is mouthwatering and just sooooo beautiful. I’d love to link you to the san Lorenzo blog, which I’ve recently taken on board. Hope you agree. They look delicious, bravo ! I wouldn’t be concerned about frying, if it’s done properly, the oil just cooks the outside and the cooking on the inside is done by steam from the combintaion of moisture and heat. Steamed food, now doesn’t that sound healthy? That said, the one kitchen item I’m not allowed to have is a deep fryer. Wow those look marvelous. And not oily or greasy at all! I feel the same way you do about fried food (well...once or twice a year, a big plate of good fries is always nice) but it looks like an exception could be made for these! i simply LOVE your blog! the pictures are absolutely wonderful and everything just seem so tempting... i’m personally a baking enthusiast but everything i see on your blog just makes me feel like everything i do is so meagre... these donuts! i’m gonna get my hands on trying to make them this holiday! You are great. I have been looking for ingredients like these for ages and all you get is this and that. Those doughnut looks wonderful... and healthy as well. OK Keiko, thank you so much for sharing this recipe: my kids just adore those cute little doughnuts .. and so did I. Thanks so much for all your kind notes as always. Hi Anna – I’m sorry I didn’t get back sooner, I went through all my emails but couldn’t find your message. Maybe you can try sending again? As for the recipes, I always note where the recipes come from, so please buy the books if you’re interested. As for the Japanese recipes, I simply don’t have time to translate them, will try when I can. Hi Jules – you can make this with a normal pan like I did, please be careful though!